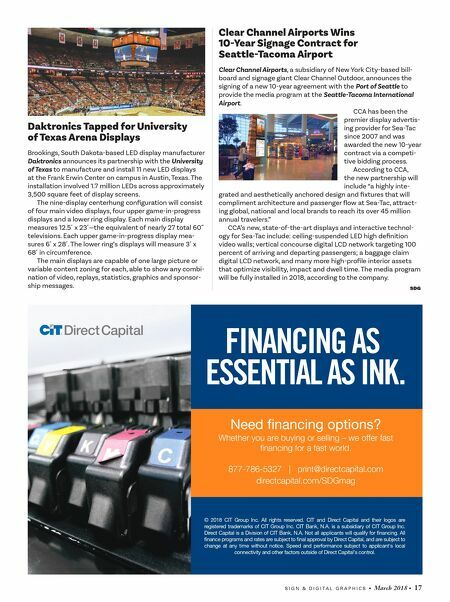 S I G N & D I G I T A L G R A P H I C S • March 2018 • 17 Daktronics Tapped for University of Texas Arena Displays Brookings, South Dakota-based LED display manufacturer Daktronics announces its partnership with the University of Texas to manufacture and install 11 new LED displays at the Frank Erwin Center on campus in Austin, Texas. The installation involved 1.7 million LEDs across approximately 3,500 square feet of display screens. The nine-display centerhung configuration will consist of four main video displays, four upper game-in-progress displays and a lower ring display. Each main display measures 12.5´ x 23´—the equivalent of nearly 27 total 60˝ televisions. Each upper game-in-progress display mea- sures 6´ x 28´. The lower ring's displays will measure 3´ x 68´ in circumference. The main displays are capable of one large picture or variable content zoning for each, able to show any combi- nation of video, replays, statistics, graphics and sponsor- ship messages. Clear Channel Airports Wins 10-Year Signage Contract for Seattle-Tacoma Airport Clear Channel Airports, a subsidiary of New York City-based bill- board and signage giant Clear Channel Outdoor, announces the signing of a new 10-year agreement with the Port of Seattle to provide the media program at the Seattle-Tacoma International Airport. CCA has been the premier display advertis- ing provider for Sea-Tac since 2007 and was awarded the new 10-year contract via a competi- tive bidding process. 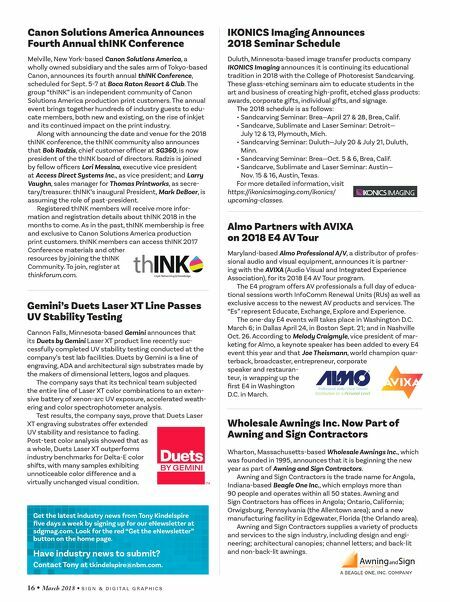 According to CCA, the new partnership will include "a highly inte- grated and aesthetically anchored design and fixtures that will compliment architecture and passenger flow at Sea-Tac, attract- ing global, national and local brands to reach its over 45 million annual travelers." CCA's new, state-of-the-art displays and interactive technol- ogy for Sea-Tac include: ceiling-suspended LED high definition video walls; vertical concourse digital LCD network targeting 100 percent of arriving and departing passengers; a baggage claim digital LCD network, and many more high-profile interior assets that optimize visibility, impact and dwell time. The media program will be fully installed in 2018, according to the company. SDG Need nancing options? Whether you are buying or selling – we offer fast financing for a fast world. 877-786-5327 | print@directcapital.com directcapital.com/SDGmag FINANCING AS ESSENTIAL AS INK. © 2018 CIT Group Inc. All rights reserved. CIT and Direct Capital and their logos are registered trademarks of CIT Group Inc. CIT Bank, N.A. is a subsidiary of CIT Group Inc. Direct Capital is a Division of CIT Bank, N.A. Not all applicants will qualify for nancing. All nance programs and rates are subject to nal approval by Direct Capital, and are subject to change at any time without notice. Speed and performance subject to applicant's local connectivity and other factors outside of Direct Capital's control.